Vitamin A provides health benefits that extend beyond ensuring healthy vision. This fat-soluble vitamin plays an important role in immunity and red blood cell formation. You can get vitamin A from your diet or a supplement. You can also find it as an ingredient in some skincare products in the form of retinol. If you are already taking it, you might wonder whether you can apply vitamin A directly to your skin from a pill. In theory, you can do this, but you must follow certain precautions. If you have an undiagnosed skin condition, you should consult your doctor rather than self-medicating. Vitamin A has received attention for its purported ability to improve the appearance of your skin. Research has confirmed some of these claims. A study by Johnson and Johnson, published in the October 2009 issue of the “Journal of Drugs in Dermatology,” found that application of a retinol-containing moisturizer visibly improved the appearance of fine lines and wrinkles in participants after eight weeks of treatment. However, researchers used a 0.1 percent stabilized solution. The use of a stabilized solution means that a more precise measure of how much was applied was possible with this study. Vitamin A has a long history of use for treating acne. In some individuals, however, its use can cause side effects such as skin irritation, depending upon the form used. A study by Klinika Dermatologii Slaskiej Akademii Medycznej in Poland, published in the June 2005 issue of “Polski Merkuriusz Lekarski,” found that vitamin A preparations in the form of isotretinoin caused side effects in almost all patients cured. Despite these effects, therapy continued. These findings suggest that direct application of vitamin A may help, but at a cost. The contents of your vitamin A pill will likely contain a carrier oil such as vegetable or soybean oil. If you have oily skin, you should avoid using greasy products to avoid a flare-up. Vitamin A can provide other benefits for your skin. Its anti-inflammatory properties can help relieve redness and pain caused by wounds or other sources of skin irritation. It may also help treat specific skin conditions. One possible use is treating cold sores. WholeHealthMD.com recommends applying liquid vitamin A directly to sores, up to three times a day. As with any skincare product, the risk for skin irritations exists if you apply the contents of a vitamin A pill to your skin. If you experience redness or irritation, you should discontinue using vitamin A. Your risk may be greater because of the higher concentration of vitamin A in pill form versus other commercial products. While vitamin A provides health benefits, it can build up to toxic levels over time, especially if the recommended dosage is exceeded. Your skin will provide a barrier but may still absorb high amounts with long-term use. Finally, unless specifically stated on the product's label, using vitamin A directly on your skin is not an FDA-approved use. 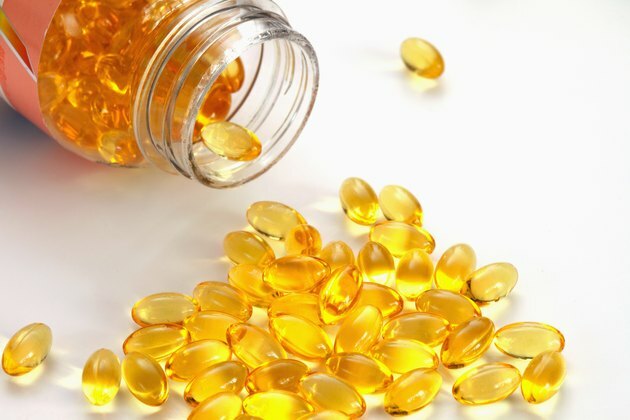 What Are the Benefits of Using Vitamin E on the Face?